Tomorrow I am beginning my summer internship (for those who don’t know, I’m a law student between my second and third years). I’m going to be working in death penalty defense. Sometimes people ask me how I find the time to write this blog. The answer is that being a student at the Yale Law School takes a good deal less time than a real job. (You can, of course, make yourself very busy with clinics, journals, and other activities, but you don’t have to.) But this summer will be like a real job, and I intend to spend the time that I’m not working with my family, which means that I will be cutting way, way back on blogging this summer. I’m guessing that I’ll write about two posts per week, but I would not be too surprised if I don’t even manage that, and there’s a small chance I won’t have time for anything at all. I expect that I’ll get back to something close to my usual frequency in late August or early September. Good luck with the law work. Good on you for setting your priorities. While I will miss your writing, you’ve got your head screwed on right. Learn a lot this summer. Your experience will be needed. Two classic film recommendations regarding the wisdom in leaving sentencing to a group and not to an individual. Second, is the Russian film version called “12”. Good luck, James. Thank you for taking the time to bear witness to the truth. Your contribution has been indispensable, you are an honest broker in a market of lies. I look forward to any return you choose to make, you help to keep hope alive for our deeply troubled republic. You can’t go telling people that studying law at YLS doesn’t necessarily take a lot of time. It’ll blow the value of that piece of paper you get next year. Next thing you know, you’ll be telling people we don’t get real grades. Shhh! Good luck with the summer clerkship. Do some good. And keep up the good work on the website. Hurry back. How about “The Verdict” with Paul Newman or “To Kill a Mockingbird” with Gregory Peck??? Actually my favorite scene is when Newman’s character hyperventilates in the bathroom, but that one isn’t so related to law. I think you’ll be pleasantly surprised at the amount of time you find to do the things you feel most passionate about. Personally I expect we’ll see you writing at least two posts per week as blogger withdrawal sets in. Good luck, James. That sounds like a great opportunity. Thanks for all the valuable insight–and for telling the truth when most of the Wall Street/Washington pundits can’t bring themselves to do so. We need the fearlessness of intellectual bloggers such as you to remind us of what could be. Good luck…have fun…and cherish your family time. We’ll be awaiting your future insights. I was thinking one day you might work as a lawyer for the the poor who have been scammed by dishonest mortgage brokers. This summer job is even more serious. I much admire your spirit. Best wishes. This is a shame for us, but sounds like a chance to do something very fulfilling. Best of luck. May your internship go well. You will be missed, James! I enjoyed your posts, James, and it will be unfortunate that I won’t get to see them more regularly. In any case, I wish you the best. Good luck James, you will definitely be missed by this avid Baseline Scenario reader! Silly me for not reading the fine print. In my periodic visits to Baseline my instinct said that James was more liberal elite commentator than economist. Lesson learned, trust your instincts. Criminal defense work = belly of the beast. Capital cases = underbelly of the beast. Ditto to all of the well expressed good wishes, especially Gary’s point. You’re one of the best. James, I want to thank you and Simon for this blog! It is always very sad for me when I finish a superb book, and that was the way I felt as 13 Bankers drew to a close. 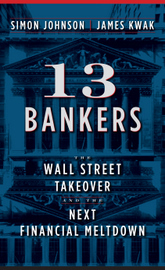 Little did I know that 13 Bankers didn’t end–but continues daily with this blog. Have a great summer. I’m a lawyer and interned with a number of kids from Harvard and Yale law schools during the summer. It was always amusing to me how little they had to work during law school, while the rest of us knuckleheads at the regular law schools were busting hump. I still remember drinking beers with the gang one night, and it came to light that all of the kids from regular law schools knew who Grant Gilmore was and each had read his masterwork, but none of the kids from YLS or HLS even knew the name! Anyway, hope you choose keep up with public service after graduation; we need the talent there. And, with all the public service support programs the rich law schools have, your classmates don’t have that good of an excuse for flocking to Wall Street firms. Nice to see honesty in a lawyer prior to graduation. I heard Yale was a breeze if you can pay the tuition. According to several well known authors Bill Clinton did not actually have to attend any of his third year classes to graduate. Sort of a microcosm of American allocation of power and wealth. Maybe you can check into a 12-step program and learn to accept those things you cannot change–however, I doubt you will. Maybe we can all pitch in to keep the blog running over the summer. Nemo, Bond Girl, Russ, Ted K, etc — what do you think? This sounds like a great suggestion to me. And don’t forget Stats Guy. Food for thought… as angels sing. Yes, Yale is the bastion of “liberal elitism”. Just ask Robert Bork who was a professor at YLS about 15 years. Bork can tell you all the yuck yuck jokes they made about abortion and how antitrust laws hurt consumers but they just weren’t as probing and insightful as Bork to figure it out. We can’t slip anything by you Georgy. Excellent idea! People will stop visiting this blog if there’s nothing new to read on a regular basis. Thanks for the kind word, Engineer. I only lurk here, but I’m compelled to wish you the very best and show much gratitude for the analysis you have provided since the inception of this blog. Stats Guy. D-def-definitely Stats Guy. Looking for a perfect Minnesota family vacation? Then look no further than Wolf Ridge Environmental Learning Center. Wolf Ridge is a nationally respected and accredited K-12 school and residential learning center located in Finland, Minnesota. It’s convenient location makes the center accessible to children, teachers, and parents in communities across Minnesota, North Dakota and Wisconsin. Recognized nationally and internationally as a leader in environmental education, the center offers educational activities to immerse participants in nature exploration, cultural history, outdoor skills, team-building, and personal growth. In addition to K-12 school programs, Wolf Ridge offers summer camps, summer family vacations, wilderness trips, graduate naturalist training, and live education animal programs. Wolf Ridge offers several outdoor activities and classes including environmental science, cultural history, contemporary environmental issues, personal growth, team building and outdoor recreation. The outdoor atmosphere is a place where minds open to the joy and wonder of discovery of our natural world. The center seeks to stimulate a love and understanding of nature by involving children and adults in direct observation of and participation on the outdoors and promote self-awareness and leadership development in the process. Located on a ridge overlooking Lake Superior, Wolf Ridge’s 2,000 acre campus is bordered by the Baptism River and features creeks, two lakes, two high peaks, 18-miles of trail and a mixed forest of maple, birch ad spruce. Wildlife is abundant and includes pine marten, eagles, moose, black bear, whitetail deer, fox, wolves, beaver, peregrine falcons and loons. Facilities include three classroom buildings, two dormitories, a dining hall, a raptor aviary, a library, two auditoriums, two rock-climbing walls, two outdoor ropes courses and an administration building. Wolf Ridge’s staff includes classroom teachers, university professors, corporate executives, nonprofit leaders, doctors, lawyers and architects. Volunteers are also on hand to help with the many projects and events offered by the center. This Minnesota family trip is exactly what your family needs to stay busy and have fun this summer. To find out more, please contact Wolf Ridge at 800-523-2733 (in Minnesota, Wisconsin or North Dakota), 218-353-7414 (all other states) or visit their website at http://www.wolf-ridge.org/.